The “experience” Dave Wireless (or the upcoming new brand name) will offer is one step closer. 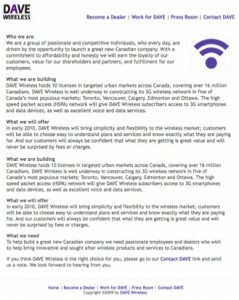 They have announced an licensing agreement with Bell Mobility for wireless cell-site sharing (reaches 93% of Canadians). This will make things a great deal easier for them and can knock another item off their to-do list… hopefully we’ll hear a confirmed launch date sooner than later, and other than “early 2010”. During the Wireless Spectrum Auction DAVE invested $243.1-million for 10 licenses. Other notable advancements over the past couple months are that they’ve signed a roaming agreement with T-Mobile and announced an exclusive multi-year contract with Ericsson to design and build their 3G UMTS network in Toronto, Vancouver, Calgary, Edmonton and Ottawa.